It is hard to really remember a time before the market was completely saturated with managament simulation games. Whenever you go to a Game (or even a Morrisons) to peruse a special offer for PC games you will see everything from hotel builders to tractor-based farm simulators. Although categorised by the list as a strategy game (seriously?) this really marked the dawn of the modern management simulator. So far we have only covered a really modern one in the form of The Movies which in terms of scope is truly worlds apart from this now 23 year old game. From what can be seen in our evaluation of games like Tekken and Grand Theft Auto is that once you have fallen for a sequel, or if a sequal was the first of a franchise that you played, it can be weird going back to the start. It is so incredibly hard to give this game a fair write-up. Both of us are on the same footing since the first game in this franchise we both played was this one dressed up in different ports. 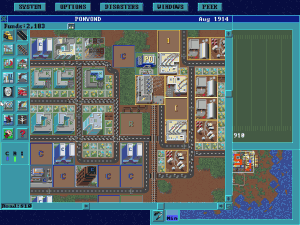 However, I quickly moved onto SimCity 2000 and as such most of my first fond city-building memories lay there. 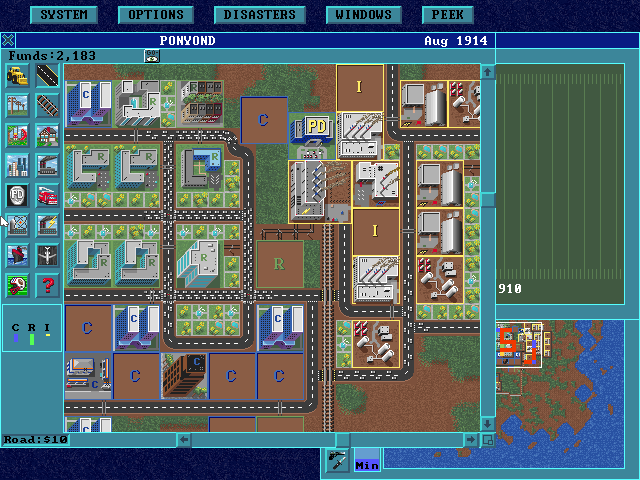 In fact, I might have started with SimCity 2000 and played this game only later. If anything the best way to tackle this is how we did with Civiliztion in that we sat down and have a good playthrough and see how it makes us feel. When you sit down to play this having played later games (although the cap on later games pretty much ends with SimCity 4 released in 2003) the first thing that really struck us is how basic this plays. Where Civilization stil had intricate complexities that kept you interested SimCity incredibly stripped back and very much like one of the many clones you find on the App Store. In fact this game has made it’s way to said store and has done rather well for itself… although thinking about it this game was really a perfect title for the touch screen generation. Not just that. Fairly recently, the game was made available (with some slight modifications) as open source, retitled Micropolis, and used as one of the default software packages in the One Laptop per Child project. And that’s where this game still shines, in a way. It’s incredibly simple, but these days it would almost be better to qualify it as edutainment. Yeah, you don’t have many different options in the simulator – it’s incredibly straight forward – but it sitll provides a simple, easy to understand model where you need to balance the needs with wants, make decisions between low taxes (which draws people in), police and fire coverage, roads and public transport, and so on. Later games added a lot more, but its simplicity makes it an effective way to learn as well. In a way, as with so many earlier games we covered (such as, recently, Breakout and One-Dot Enemies), its simplicity makes this game more addictive. Something that is still rather enjoyable about this game over the sequels are the live-action videos. Whenever there is a disaster (or something more mundane like raised crime rates or a traffic issue) there is a short clip featuring people with eighties-style hair which may or may not be on fire depending on the emergency. It’s a small touch but enjoyable nonetheless. These days, you can probably find the sequels for this game as cheaply as SimCity itself. Go and get those if you can. Seriously. They are better. But now that this game is open source, it might make for a nice diversion. It doesn’t compare to the later experience, but this time that doesn’t matter. More of these games are on their way, and there’s a whole universe of games under the ‘Sim’ brand we won’t cover – SimTower, SimFarm, SimIsle, SimLife and many more that are nice simulations, but just not as big. On the other hand, if you want a bit of videogame history, one that would play well on the mobile devices we have now as what we’d call a casual game, this is a good one to go for. It’s complex but fun, deep but not too deep. And it can be commended for that. Just understand it’s a relatively simple game.